Thanks so much! Had to order boxes for youth group at church, We had sold 1200 fried pies as a fundraiser and we use the boxes for the orders. We were short on boxes and had to do an express shipping order. Contacted customer service and they are the best they were so helpful. Ordered one day and they were there the next evening! Everyone brags on our boxes and presentation for our pies. 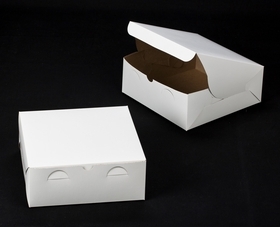 The boxes are always the best quality and are very sturdy. Thanks so much for helping our fundraisers look professional with your boxes. We always keep our orders with you! Thanks again! This is my second order of these great boxes. We love them for our cheesecakes as they are leak resistant and close tightly. Most of our customers keep them in the fridge for a week or so and they hold up beautifully. And I can personalize them with colorful labels and our business information. Love them - right size right price. And fast free delivery. Thanks BRP! !